This free punky font is created by Flou. 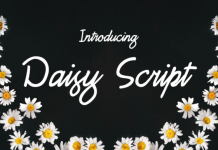 It’s an unique font with a vintage kind of personality. We’re sure that you can use this one in one of your projects! Next articleWhere to get high quality Photoshop Brushes?